A successful open house requires a well-chosen and presentable home, a well-organized host, and an impeccable follow-up plan so that no prospect gets lost in the post-event period. Use the following information to guide your planning. In addition, you may want to use the worksheet featured here to be sure that you cover all the planning bases and arrive ready to open the doors to a successful event. © Real Estate Champions. Used with permission. 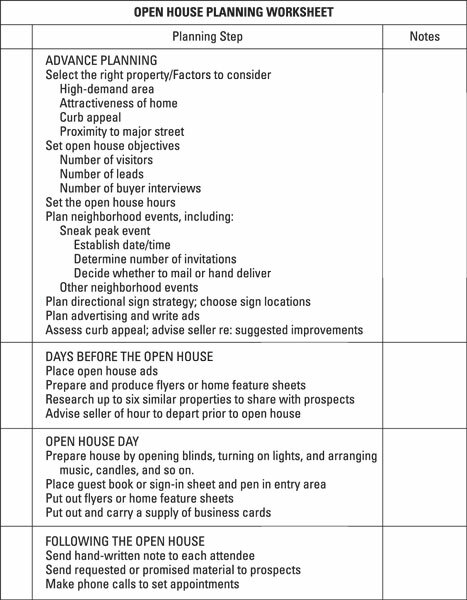 Use this worksheet to standardize your open house planning. Before you swing open the doors to open house guests, be sure that the home is clean, bright, and welcoming — and be sure that you’re ready to present not only the home you’re showing but also other homes that may better fit the interests of your prospects. Keep the feature sheets simple. Include a picture of the home and information about bedrooms, bathrooms, square footage, and amenities. Include your picture and contact information. Research proves that most guests won’t buy the home you’re showing, but they may very well buy into the idea of working with you on their future home sale or purchase. The feature sheet provides prospects with information on how to contact you. Before the open house, arm yourself with information on about a half dozen other homes that are similar in price, amenities, neighborhood status, and geography to the one you’re showing. Then when an open house guest indicates a lack of interest in the home you’re showing, you’re prepared to quickly and easily shift the discussion to another possibility. Load the listings onto your tablet so you can quickly access them to show buyer prospects. You can also prepare and preview properties in a price range just below and just above the price range of the home you’re in and have that information loaded as well. Come armed with your tablet and prepared to show your market knowledge and expert command of the inventory. The best research approach is to personally tour each home so that you fully understand and can quickly describe its attributes and how it differs from the home you’re showing. At a minimum, take a few minutes to review the pictures and virtual tours of each home that is similar to your open house. Then if a prospect expresses to you that the open house home won’t work because the backyard is too small, for example, you have firsthand knowledge with which to describe the large yard of another home you can recommend. Without intending to do so, the owner may convey to the prospect a strong desire to move, causing the prospect to believe that the owner is anxious to sell, which may prompt a lower initial offer. The seller may say something that raises a red flag about the condition of the property. The seller may describe his or her favorite things about the house. If these features are ones the buyer dislikes and is thinking about changing, the seller’s input may simply shut down interest in the home. Most sellers want to help you sell their homes, and, the truth is, the best help they can provide is being absent during the open house. Right before opening the doors to your open house, take a moment to enhance the warm, welcoming feeling attendees want to experience upon arrival. Throw open blinds to expose nice views. Turn on lights to brighten corners. Burn candles and plug in air fresheners to scent the air. Set out simple but tasteful refreshments to encourage attendees to linger. Place a guest book or sign-in sheet, along with a pen, in the entryway or at a point where guests gather. Keep a stack of business cards and house flyers in a visible location.